The Standard missile program was initiated in 1963 to provide a replacement for the RIM-2 Terrier and RIM-24 Tartar missile systems. The Tartar replacement was designated RIM-66 Standard MR (Medium Range), while the longer-range Terrier replacement became the RIM-67 Standard ER (Extended Range). 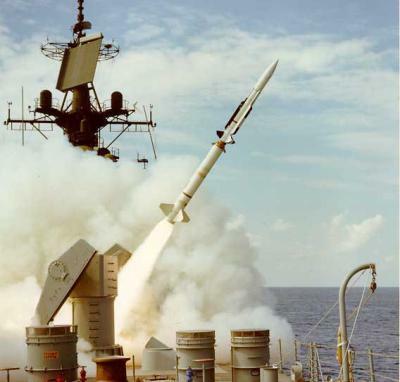 The Standard is still the U.S. Navy's main medium and long range air defense missile. All blocks of the Standard SM-1ER missile were designated as RIM-67A. They were essentially identical to the corresponding SM-1MR missile, except for the propulsion. Instead of the MR's MK-56 dual-thrust motor, the ER used an Atlantic Research Corp. MK 30 solid-fuel rocket sustainer motor, and a Hercules MK 12 booster. The main improvements of the SM-2MR Block I/II/III missiles were also included in the corresponding SM-2ER versions, the major new features being the inertial guidance system, and the monopulse seeker for terminal homing. 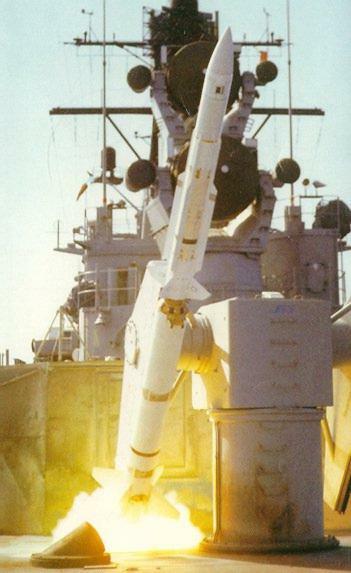 However, SM-2ER is not designed to be fired from Aegis ships. The SM-2ER Block I was designated RIM-67B, and entered service in 1980. The RIM-67C SM-2ER Block II introduced a new MK 70 booster (regrained MK 12), which almost doubled the range of the SM-2ER. Interestingly, the enhanced booster extended the performance envelope of the RIM-67C well beyond the limits of the then current fire-control system on Terrier ships, but it did of course improve general missile performance against high-performance targets. The RIM-67D SM-2ER Block III had a new model of the sustainer engine (MK 30 MOD 4), and an improved MK 45 MOD 8 TDD (Target Detecting Device). The SM-2ER Block IV is a version with a completely new finless booster, designed for vertical launch on Aegis/VLS ships. Although this has been reported to be designated RIM-67E, the correct designation is RIM-156A, q.v. In the 1980's the U.S. Navy planned a nuclear-armed version of the Standard SM-2ER, because the last nuclear armed surface-to-air missiles, the RIM-2D Terrier and RIM-8E/G/J Talos, were about to be retired, leaving the Navy without a nuclear anti-air warfare capability. The nuclear SM-2 was to be equipped with a W-81 fission warhead (4 kT yield). However, these plans have since been dropped, and the U.S. Navy has currently no nuclear-armed SAMs. In 1995, Hughes (now Raytheon) proposed to convert obsolete RIM-2 Terrier missiles, of which more than 2000 were in storage, to supersonic low-altitude target (SLAT) configuration as a replacement of and/or successor to the MQM-8 Vandal. At 10 m altitude, range would have been 40 km (22 nm) with the MK 30 motor, or 64 km (35 nm) with the new MK 104 dual-thrust motor. As a ballistic missile target, maximum altitude and range could be 85 km (280000 ft) and 275 km (150 nm), respectively (168 km/550 km with MK 104 motor). The designation YRQM-67A was reserved for protoype conversions, but the Terrier conversion plan was eventually dropped. However, Raytheon has converted many surplus SM-2ER rounds (mostly RIM-67C) to TMT (Terrier Missile Target) configuration to serve as ballistic missile targets. Although I don't have firm evidence, these targets are probably designated RQM-67A.